When Father Joseph Williamson arrived at St Paul’s Dock Street in 1952, he found a church in need of repair. A Poplar lad without much formal education, he’d spent the last 25 years in rural parishes, building up the confidence to return to the East End as a priest. Before he began crusading against the slum landlords and pimps who plagued his parish, Father Joe, as he was universally known, set about restoring the church, beginning with its defining feature. This being St Paul’s Church for Seamen, it wasn’t a cross that topped the steeple, but a weather vane in the shape of a ship. Dressed in his trademark cassock and biretta – the kind of chocolate box headgear favoured by Italian clergy – Father Joe paraded the weather vane around Wapping in a hand cart, puzzling his new parishioners and raising funds for it to be regilt. Today, the ship is golden once more. 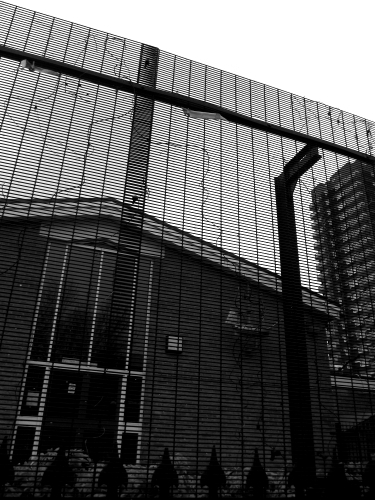 But with the church sold off, it’s pinned like an oversized brooch to the wall of the parish primary school – once a school for sailors’ infants, said to be “the first in the kingdom” to serve “poor children’s dinners”. Missing its pointer, its north, south, east and west, the ship can be glimpsed from the Highway – the incessant carriageway that links the Isle of Dogs and the City of London, and gives everywhere in between a similar sense of placelessness. The ship is one of the few traces of this area’s nautical history, bar the massive walls that once circled the docks, but now circle the yuppie office blocks that sprung up in their place. In the 1800s, a cluster of buildings dedicated to the welfare of seamen stretched from Wellclose Square to Dock Street. Alongside the church and its school was an asylum, then a home, for down-on-their-luck sailors – shipwrecked, ill or between boats. Józef Korzeniowski stayed here before he gave up the life of a sailor for that of Joseph Conrad, and before the home became the Red Ensign Club – a mariners’ hostel and cookery school that endured until the 1970s. 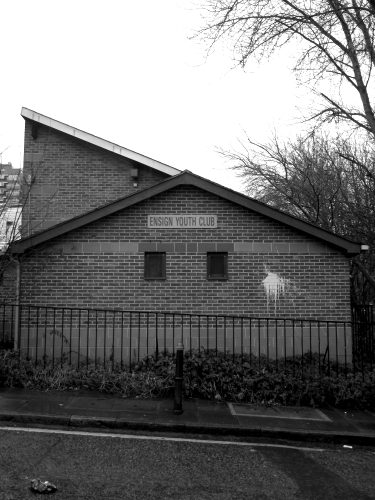 Its name lives on in a local youth club, while retired seamen still discuss it on internet message boards, likening its “berths” to Alcatraz cells and swapping tales of advances misspent in the Brown Bear nearby. Heading west, the Highway meets John Fisher Street and Thomas More Square, named after two men who share a Saints day in the Catholic calendar. Refusing to accept Henry VIII’s claim to supremacy over the Pope, they were beheaded within a fortnight of each other on Tower Hill up the road. Before their heads were stuck on a pike on London Bridge (Fisher’s was still “ruddy and lifelike” after two weeks, causing such a stir that it was tossed into the Thames and replaced with More’s), both their bodies were temporarily buried at All Hallows-by-the-Tower. This small church, the oldest in the City of London, could feel lost among the chain restaurants that orbit the Tower, if it weren’t competing for the same tourist custom. A white neon cross hangs above the chancel – a bright beacon that shines through the ancient stained glass, holding its own against flashier signs assuring passers-by that a basement KFC is open. 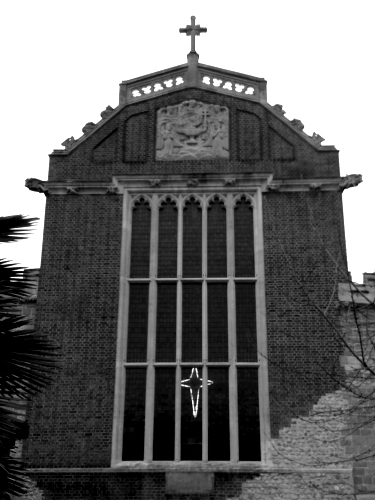 Like St Paul’s, All Hallows has a long maritime affiliation – its interior is full of model boats and relics from the Cutty Sark and Spanish Armada, and it sits opposite Trinity Square. 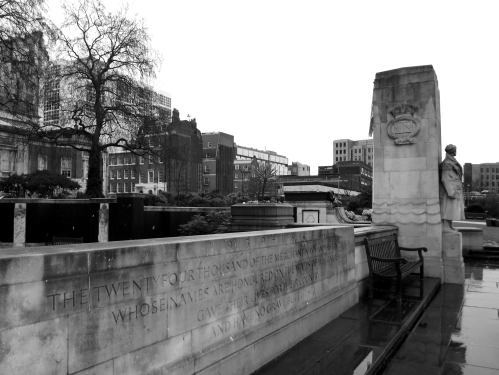 Here, the Tower Hill Memorial names, individually, all 36,000 merchant sailors and fishermen who died in the two Worlds Wars and “have no grave but the sea”. With a grim smile, a sign urges visitors to “keep it clean and shipshape”. Around the square, Poseidon looks triumphantly down from the old home of the Port of London Authority, which has moved downstream with the docks it controls. Next door is Trinity House, England’s lighthouse authority, and across the road are neighbouring plaques commemorating Reverend Philip “Tubby” Clayton and Lord Wakefield of Hythe, who favoured the appellation “Cheers” – his mother’s maiden name and his middle one. Tubby was the vicar at All Hallows from 1922 to 1962 and founder of Toc H – the “Every Man’s Club” established in Belgium in 1915 to give soldiers, of any rank, respite from the trenches. Cheers was a Liverpool engineer and entrepreneur, who found that adding a little castor oil to lubricants made them work better. He called his invention Castrol, amassed a fortune in the motor car boom and moved to London, where he became a prolific philanthropist. Together, the pair set up the Tower Hill Improvement Trust in 1934, buying and demolishing buildings like the Mazawattee Tea Warehouse, which had outlived the area’s days as a working dock and blocked the view from the hill down to the river. For a good part of Tubby’s time at All Hallows, his church was being rebuilt. It had escaped the Great Fire of London thanks to the quick wittedness of William Penn, the future founder of Pennsylvania baptised at the church, who blew up a row of houses around it to create a firebreak. Penn’s colleague at the Admiralty, Samuel Pepys, recorded the scene. Having safely deposited his wife and gold in Woolwich, he returned to the city at dawn to watch, from All Hallows tower, London be consumed by flames. It was “the saddest sight of desolation that I ever saw,” his diary notes. The church didn’t escape the Second World War however, with bombing leaving only the walls and tower intact. A similar fate befell St Dunstan-in-the-East nearby, but while All Hallows opened again in 1957, St Dunstan remains open only to the elements. Being a few streets closer to Pudding Lane than All Hallows, St Dunstan fared worse in the Great Fire. Pepys reports that after a “mighty merry” evening in 1668 fuelled by lobster and ale, he was accosted by “two rogues with clubs” near its charred remains. But 30 years later, Sir Christopher Wren rebuilt the steeple, choosing, uncharacteristically, a gothic style sympathetic to the original church. So confident was he in this Hergé rocket of a design, that when a critic gleefully told him all of his steeples had been damaged in a storm, “Not St Dunstan” was Wren’s knowing reply. In fact, it survived a few hundred years and the full force of the Blitz – when the nave took a direct hit, the tower remained standing, albeit with three of its bells clanging to the ground. 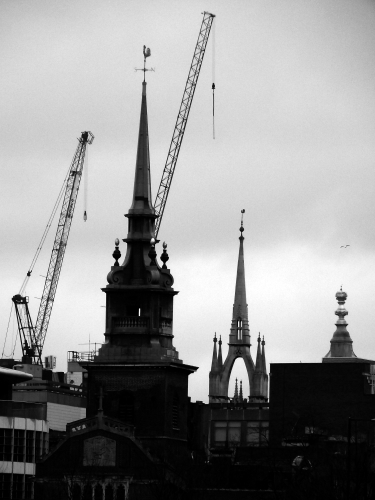 Today, the bells are no longer in the steeple and unlike St Paul’s ship, they haven’t found a new home nearby. Instead, they’re installed in the pueblo tower of a Californian winery. Sold off in the 1970s, they’ve achieved mythic status in campanology circles, especially as two were destroyed during the removal – one cut to pieces to fit through a hole in the tower, the other knocked off the back of a lorry outside. St Dunstan itself is now a park, with lush planting filling the remains of its walls. As the same traffic that sped along the Highway – and has since slalomed round the Tower and on to Upper Thames Street – presses onwards, under London Bridge, it feels like an oasis of calm. 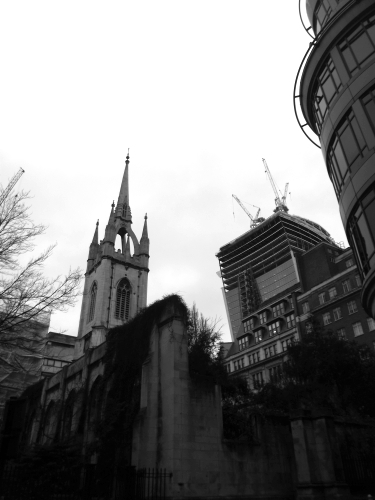 Despite the bad luck of years gone by and the growing spectre of 20 Fenchurch Street – the “Walkie Talkie” skyscraper that now bulges over it – Wren’s steeple still peeps, optimistically, through the trees, into the sky.